The following article continues a series detailing various positions that our firefighters fill. From basic skills to top management, all roles are vitally important in making our Fire Company function well. We hope these articles help community members better understand how we function as a team using everyone’s strengths within a chain of command. Leading the Hand-in-Hand Fire Company on the administrative side is the president, who is also the chair of the Board of Directors. This Board consists of 12 members: president, vice president, recording secretary, financial secretary, treasurer, chief, deputy chief, assistant chief, fire police captain and three members at large. The president and Board of Directors are responsible for making sure the Fire Company’s mission is accomplished and the vision is fulfilled. Giving direction, setting goals, and establishing a specific tone and rapport are also included in the president’s tasks. The president is voted into office by the Fire Company membership every December and serves until a successor is found. It is important for presidents to identify leadership qualities in members and mentor others to come on board when they step out of this role. In a nutshell, the president presides at the Board of Directors meetings on the last Tuesday of each month and Fire Membership meetings on the first Tuesday of each month. He also appoints committees and sits in on their meetings. Presently there are six committees: Nominating, Pot Pie, BBQ, Half Marathon, Administrative and Human Resources. 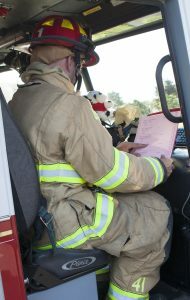 Overseeing the day-to-day operations of the Fire Company is a major part of the job. Firefighting is just one aspect of this organization. There are other areas requiring management and an eye for detail. The president takes care of phone calls and emails, is in touch with financial officers, serves as a spokesperson and represents the Fire Company when there are legal issues. The president also keeps track of how plans are implemented and follows through to assure projects are completed. Working with volunteers in a nonprofit organization requires skill in leading others, motivating them to rally around a cause and to move forward on projects. It should be done in a way that avoids unpleasantness or opposition and without offending or hurting others’ feelings. It takes diplomacy to be president! It is vital to the president to have competent people in the many Fire Company positions. When volunteers do their parts well and with skill and expertise, a leader benefits from all the cooperation. It is also crucial for the Fire Company to have overriding principles that are sustainable, enduring, and able to continue even when a new president is installed. Bird-in-Hand is fortunate to have both of these attributes and they help make our Company successful. 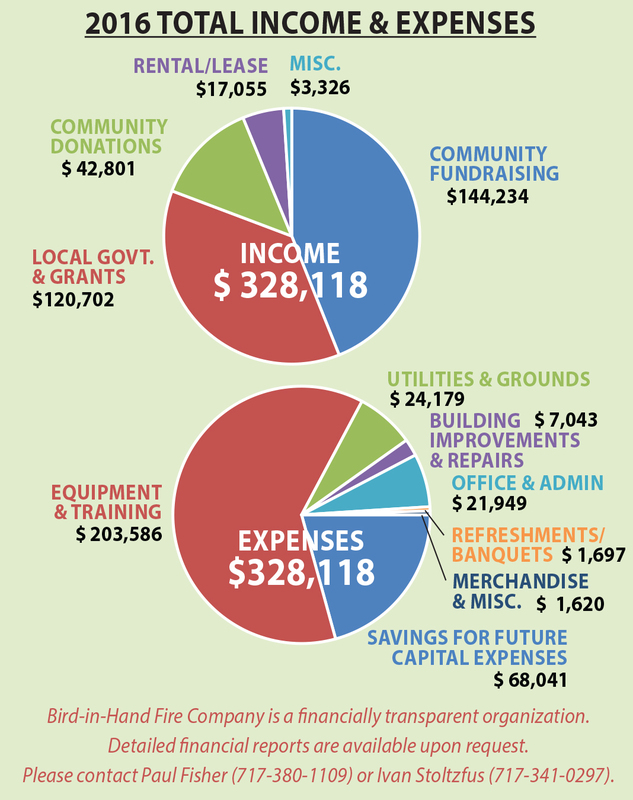 Thanks to the support of our community, 2016 was another financially strong year for the Fire Company. 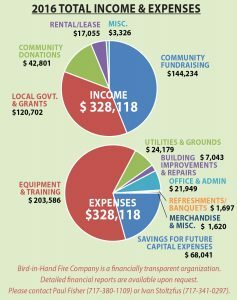 We continue to rely on our community for the financial support we need to provide excellent fire protection for all of our friends and neighbors. During 2016 our largest expense was the purchase of 18 new self-contained breathing apparatus for our firefighters at a cost of $122,000. This equipment is a critical part of the full protection we provide to our volunteer firefighters. We ask that you please continue to stand by our volunteers by supporting them with a donation in 2017. Remember, even if you’re only able to give a small amount, your support makes a difference. Fire Police Officers are an integral part of the Fire Company and respond every time there is an emergency call. One of their main functions is to ensure the safety of firefighters and protect their vehicles and equipment at the scene of an incident. They also protect residents, spectators, and media personnel from being harmed; set up a yellow tape security perimeter around the incident to keep them from interfering with the work of the firefighters; and safely direct motorists around the scene. When their pagers go off, the Fire Police Officers drive their personal vehicles directly to the scene. After arrival, the first thing the Fire Police Captain does is to assess the magnitude of the incident. He then works closely with the Fire Chief to determine how far back onlookers must stay, which roads need to be closed, and what alternative routes and detours can be set up. Using his radio he assigns the Fire Police Officers to direct traffic at key locations. In their personal vehicles Fire Police Officers carry flares and at least three traffic cones, enough to close down a road until more equipment is available. The Fire Company squad truck carries the Detour, Road Closed, and Incident Ahead signs as well as barricades and cones. Firefighters make the rounds to set out and then gather up the signs. Safety gear for the Fire Police Officers includes high-visibility lime jackets and pants. Three essentials they must have while on duty are an official hat or helmet, a metal badge, and a flashlight with a red cone. High-visibility safety vests are also a standard requirement. After the Fire Company brings new Fire Police Officers on board, they go before a local judge or the township supervisors. Classes that lead to certification are offered at the Lancaster County Public Safety Training Center in Manheim. The classes cover traffic control, the proper use of PennDot required traffic control devices, PA State Traffic Laws, and public relations training to enable the Fire Police Officer to better relate to civilians at any given incident. Personal appearance and grooming is a major part of the training. In addition to fires and accidents, Fire Police Officers protect the community during weather-related emergencies, such as road closings due to flooding or downed wires and trees. 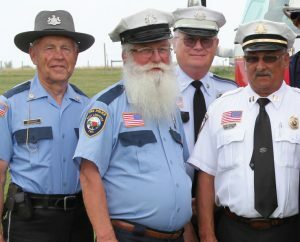 They are also called upon to direct traffic during large community events such as the Bird-in-Hand Half Marathon and Lancaster County Carriage & Antique Auction. Fire Police Captain Norm Decker and Fire Police Officer Les Fazekas contributed to this article. During the months of September and October the Fire Company will be taking our annual census. Volunteers will go door-to-door on 26 different routes in our first due area, the area in which our company is expected to be the first to arrive on an emergency scene. The basic information collected or confirmed includes the occupant’s name, a mailing address, phone number, number of adults and children, the township name, and emergency contact number. More detailed information asks about residents who have difficulty walking; whether the property is a residence, farm, or business; whether the occupant is the owner or a renter; if oxygen tanks are present; and the type of heating system in use and the fuel supply source. The Fire Company adds a clear description to each entry of the distance to the nearest water supply. After all of the updates and yearly corrections are made, the results of the census are entered into a computer database and then compiled into a 200-page printed report. The 2017 report will be placed in each of our vehicles and lists every house number on every street in our community along with lifesaving information that our chief and line officers can refer to when there is an emergency. The report is alphabetized by street and the house numbers are in numerical order for quick reference. Our Fire Company protects 1400 different properties. The firefighters want to be as prepared as possible when responding to an emergency at these properties. We thank you for your cooperation when the census taker calls on you in the next weeks. Sharing your correct information with us helps us keep you safe!